Despite having a very mild winter so far, we had fun exploring the idea of colder climates. 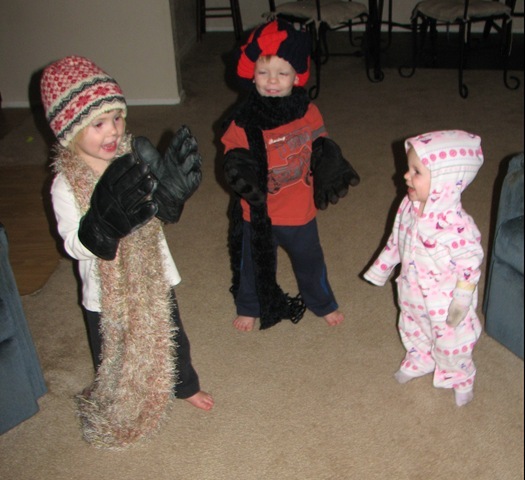 We learned about hats, gloves and scarves and would have taken a walk wearing them except it got too warm. 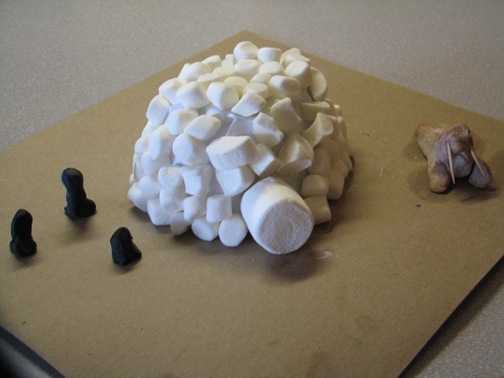 We made igloos out of marshmallows – while we started out with plenty we almost didn’t have enough to finish! Here is the finished igloo along with some penguins and a walrus that we made from play dough the next day. 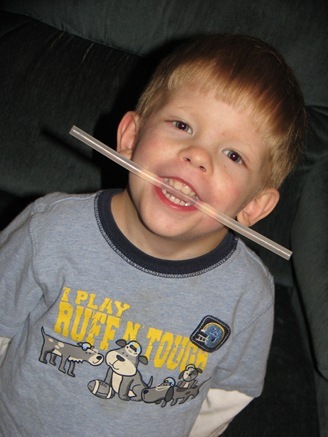 Later Lance came up to me like this, declaring he was a walrus (the glue stick being his tusks I guess). We practiced some writing skills, following a grey line to take the polar bear to the iceberg. 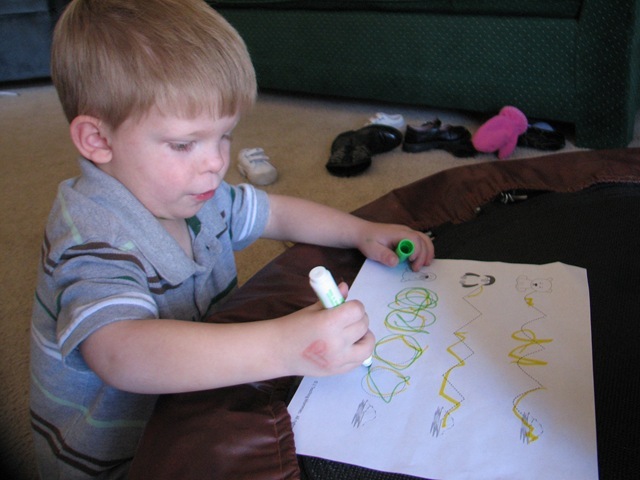 Lance tries his hand at circles, zig-zags and wavy lines. 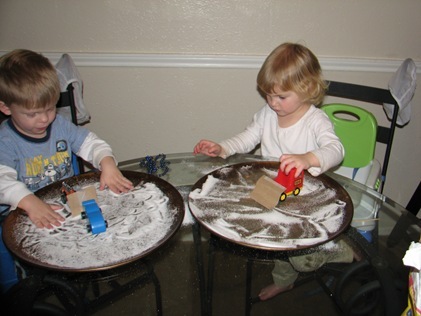 After reading a Richard Scary book about a snow storm, I made snowplows out of their toy cars by taping some cardboard to the front. They pushed sugar around the pan and surprisingly never figured out what it was! 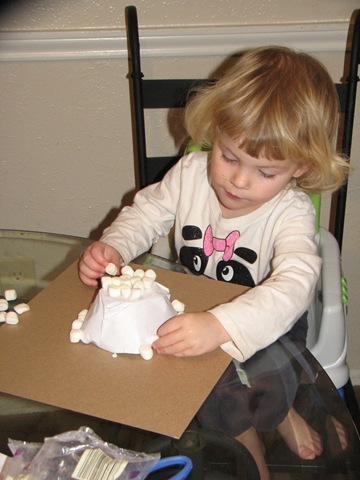 They also made a “snowstorm cake” (featured in the book) when we went to the park. This was such a fun activity (filling a small container up with sand and grass) that Lance must have made a dozen of them and wanted me to partake of each one. He also put several toys on a plate at the house and wanted to “bake” his cake in the dryer. That’s amazing that they never figured out what it was. Otherwise there might have been a snowstorm on their tongues. 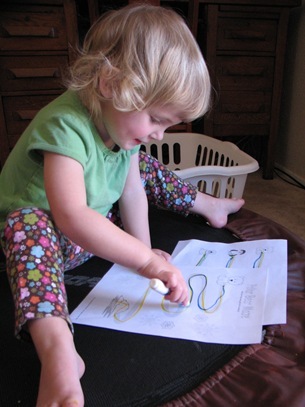 I especially liked the look on Flora’s face in the first picture and Lance’s tusk idea with the glue stick. I love the snow plow idea! Did you stick the marshmallows on with glue, or was the igloo edible? Great ideas, Amy! It looks like so much fun!